Thank you for your interest in my writing. My website is in desperate need of revamping, but I'll try to fill you in on the various series and hopefully help people decide where to start reading. To learn more about each book, see this page. I should also mention that you can buy copies directly from my store. Doing so cuts out the middlemen (so a higher percentage of your money will stay with me), you can get your books signed, and 10% of the profits will go to Fantasy for Freedom Fighters to provide books to service men and women stationed overseas. All the books take place in my fictional world called Elan, but at different historical times. Some people call Legends a prequel (because it happens before the Riyria books), but that's not accurate. First, the characters (the heart of the book) are very different between the two series. Also, the events in Legends take place in the distant past when the cultures and technology were dramatically different. Most importantly, no knowledge of Riyria is required to enjoy the Legend books to their fullest. As such, these are two independent series that just happen to share the same geography. The primary connection between the two is that characters who are mentioned in historical terms in Riyria are met face-to-face in Legends. For those who do read the Riyria books, they'll see the contrast between legends and the reality of the people who shaped the world. Unlike Legends, The Riyria Chronicles truly are a prequel to Revelations. I know many people shy away from prequels, and I think that's unfortunate as there are some great stories in the Chronicle novels. I will say that I'm pleased that so many people refer to Chronicles as "prequels done right." To understand why I wrote a prequel (rather than a sequel) some background would help. When I wrote the six novels of the Revelations, I completed the entire series before publishing any of the books. This technique allowed me to create a story with interwoven plot threads and a satisfying conclusion. I didn't expect there to be any more stories with Royce and Hadrian, but pressure from my wife (who has a crush on Hadrian), and outcries from my readers, encouraged me to write more. I feared that "tacking on" by writing a sequel would have the very real possibility of ruining an ending I was exceedingly pleased with. So I decided to go to "the other end" of the timeline. Since Royce and Hadrian had been together for twelve years before the first page of the Riyria Revelations, it made sense to go back in time and explore the full details of how they met and formed their little thieves-for-hire enterprise. I wrote The Riyria Chronicle very differently than The Riyria Revelations. I would rather have the pair leave too soon than overstay their welcome. As such, the Chronicles are standalone novels, and I want to be able to end the series without leaving readers hanging with unanswered plot points. So I release a book, take the reader's pulse, and if they still want more...well, no one is happier than myself. I've outlined ten novels, but I have no idea if all of them will be produced. Because of this uncertainty, I write those stories as standalone tales. Writing self-contained novels also means that each Chronicle could serve as an introduction point for the entire body of work that is Riyria. It's a better value - each book is two full-length novels in one volume, and since all the books cost the same, you get two books for the price of one. It's the way I wanted to introduce readers to the characters and the world. I start out simply (holding back so I can expose character backgrounds and world building across the whole narrative). And I ramp up the stakes with each subsequent novel. The idea was to make each book better than the previous, and feedback indicates I hit that goal. I put little Easter eggs in Chronicles for people who have read Revelations. These aren't anything that would affect the plot, just little winks and nods for "people in the know." So, with that in mind, I suggest starting with Theft of Swords. But if you like tales told chronologically, then, by all means, begin with The Crown Tower. Those that have read chronologically swear their way is best, so I feel like I hit the mark of making either approach work well. As mentioned, this series is completely separate from my other books, and no prior knowledge of Riyria is necessary to enjoy Legends. For those who do read both, they'll find many Easter eggs related to the truth behind historical figures. After all, history is written by the victors and they dictate what future generations will remember about their exploits. Like Revelations, all six books of The Legends of the First Empire were written before the first book was published. This statement has caused some frustrations with readers who can't get the next book right away. There has also been speculation that there's a nefarious plan (by myself and/or my publisher) to keep the books from readers. The answer is far less sinister and very simple: there is a big difference between written and done. After finishing a series, I gather feedback from Robin, my wife and alpha reader. In the case of Legends, she indicated that books 1 - 3 were in good shape, but 4 & 5 were rushed, had some plot holes, and some of the character's motivations were muddled. To correct these deficiencies, I spent a year implementing the changes, and in the process, the series grew from 5 books to 6. While that work was going on. Age of Swords (book #2) remained idle. You see, not only is there additional work after a series, but each individual novel has it's own heavy lifting. For instance, I solicit feedback from a number of sources: beta readers, my agent, and two or three people at my publisher. These people provide me with valuable input that has to be incorporated. Sometimes, a change may have a chain effect, requiring alterations not only to the book being critiqued but all the books that come after. In addition to the story, there are other aspects of the final product that takes time to produce: book covers, line edits (to improve and smooth the prose), copy edits (to fix grammar errors), layout and proofing, and many, many, re-reads to make sure everything is the best it can be. All that takes tremendous amounts of time, and that effects the release schedule. That's six books in 4 years, which is a pretty good track record (actually it's 7, because The Disappearance of Winter's Daughter came out in December of 2017 (buy direct) and October 2018 (standard retail)). Age of Myth (book #1 of Legends of the First Empire) - if you like epic fantasy with a large ensemble cast. Theft of Swords (book #1 of Riyria Revelations) - if you like adventure stories with likable rogues who "have a very particular set of skills; skills they have acquired over a very long career." And you want their story to unfold as originally intended by the author. The Crown Tower (book #1 of Riyria Chronicles) - if you like adventure stories with likable rogues and you prefer to read chronologically. The Death of Dulgath (book #3 of Riyria Chronicles) - if you are interested in the Riyria books but want to hedge your bet a bit. This is a standalone novel, so if you don't like it, you won't be left with unanswered questions that would occur when starting with the other Riyria books. If you do like it, then I would suggest the next read should be Theft of Swords, and you should read the remaining books in order of publication. The Disappearance of Winter's Daughter (book #4 of Riyria Chronicles) - Like The Death of Dulgath, this is a standalone novel, so if you don't like it, you won't be left with unanswered questions that would occur when starting with the other Riyria books. If you do like it, then I would suggest the next read should be Theft of Swords, and you should read the remaining books in order of publication. Age of Legend | Age of Death | Age of Empyre - Each of these books is in the same state. Major rewrites have occurred since the first alpha read, and I've incorporated additional changes based off alpha reader review of that second version. Robin has now deemed the books "good to go" and there are just a few minor changes that need to be made before the books enter into beta. Arrow of Death (The Rise and Fall Book #1) - I started writing this book while waiting for copyedits and feedback for the remaining books in the Legends series. I'm about 80% through and have it in a good state so that I can switch back to Legends and finish it up. This is the first book in a planned trilogy (although like my other series, it may grow in length). It takes place in the time period between Legends and Riyria and shows the collapse of the First Empire. I just finished my second listen through the Riyira Revelations series and, as always, the second time around brings up more detail! I'm stuck with the feeling that there could be a book series that picks up where Revelations ends. (SPOILER ALERT) since Marick took Deegan's necklace did he survive Royce's assasination attempt? Since Ally told Arista that Arcadiace could do magic and we never saw him do any, did he survive the explosion and if so, is he still scheming and manipulating? What about the guy Ezra Harden was scared of? The one who set the world on a wobble to watch how it would correct itself, where is the resolution for his storyline thread? Does he have agents or descendants in Elan that are causing a wobble? I sure hope your planning on answering these questions in a new book series soon! PS sorry if I got the names wrong, I've been listening to your books on audible! Glad you enjoyed the books. These are all questions worthy of speculation. I can't say when and how they are answered - as that would spoil the fun. But yes some of these are addressed in existing books or future releases. I just finished it as well and I want to know what happens next too! I felt this story could go on and nobody has overstayed their welcome. Well done Michael. Love Royce and hadden so well done, want more so much, but do want to know about Royce after don't want to say so no spoiler but you know at end when Gwen tells hadden to show Royce mercy. Never have I encountered a book (series) that contained characters with whom I both identified with and fell in love. Royce and Hadrian presented a dream team of excitement that I plan on listening to again and again! Thanks for such lovable characters and such an intriguing story line! You are very welcome! I'm so glad you enjoyed the listens. More coming soon. The Disappearance of Winter's Daughter (Book #4 of the RIyria Chronicles) is releasing December 5, and the pre-order for it is already up. I've just finished rereading the Riyria Revelations for the first time since 2012 (I think) and I'd forgotten how much I loved them. Thank you so much for these wonderful books. I actually cried quite a bit when I finished them because the story was over and I had to leave these wonderful characters and because everything just came together so well, and parts of the ending were very emotional! I read a lot of good fantasy and never cry so thank you! I love how all the hints you've dropped through the book come together at the end but they're not enough to let the reader guess the full story before then. I'll have to get stuck into the Chronicles to get more of the characters - I'm glad I guess that you didn't go with a sequel, as the ending really is perfect (much as I never want to stop reading about them!). Keep it up my friend! You have a true talent for words and character/world development. I'm just finished with the The Riyria Revelations and The The Riyria Chronicles and beginning The Age of Myth as we speak. I'm listening through Audible and the Narrator is really making magic of an already brilliant set of tales. I'm bummed the rest won't be ready for a while yet. Ahhhhh! You said to reach out and share how we the readers feel....well I for one want more Royce and Hadrian. You should really consider a sequel to Revelations. I know you wanted it to end well but there's so much more to know about these characters AFTER the major events of Revelations!! I loved hearing the little anecdotes about how your wife was involved in helping the books along and encouraged you to write more about these two guys. I couldn't agree more. Can't wait to see what else is up your sleeve. All the answers are in the book. Read it again. Max is correct. The only thing I didn't specifically say was how Royce survived after Miranda's mother abandoned him. That's for another day, but honestly, if you're smart and read carefully, it ought to be obvious. I have listened to these books 7 times now and have the same questions as the commenter above. I'm guessing that the terrible thing Miranda's mom did was abandon Royce as a baby. Was he a twin? Did Degan grow up thinking he was adopted even though he was actually her biological son? How did this story unfold? We can't all have the incredibly nuanced mind of Royce. Some of us are more like Haydrian. We take things at face value and miss some of the more subtler clues. As stated above, the story is amazing as is. THANK YOU for sharing Royce and Hadrian with us. I love listening to them chatter and bicker with each other and find myself laughing and giggling at their exchanges. Thank you for writing the stories that fill in the gaps between Chronicles and Revelations and I too would really love it if you would write a sequel series to Revelations. I'm not done with Royce and Hadrian and hope that you aren't either! I want to tell you but wont post the spoilers here. It's all in the books. Listen to what Arcadius tells Miranda. There are other hidden things in these books that connect to the legends series. I BIG clue on the way to the emperor's tomb. You'll just have to listen and enjoy it again to find out. The answers really are there. It's not like "who killed Asmodeon". I don't think of it as a spoiler to say that Miranda stated her mother seen the womans abdomin move after the killers left the room. I listened to the whole series about 2 years ago everyday at work. It got to the point where I couldn't wait to get to work so I could listen and I would dream about it at night. LOL I think this entire series would make and excellent movie as long as you don't budge on the story and keep it exactly the same. A tv series or cartoon would also be nice where some of the shorter side stories can be told. I'm a fantasy junkie and have read many many series and books. The Riyria books stole my heart instantly! I'm anxiously awaiting #4. Thank you for your great work! Keep it up!! Hi Michael, I read Age of Myth and honestly loved the book. I read the hobbit and lord of the rings and tried to find something along those lines of the fantasy, "middle earth" type of book. This is exactly what I was looking for. On your website and store there are pre order promotions for age of myth but not for age of swords. I would love to purchase a pre order package for age of swords as well as age of war from you. A book mark signed, the map and all the other additions sounds great! I was wondering if I would be able to buy a pre order package from you directly, so you get the most of my money, and I could receive a signed copy or something like that. Keep up the great work, the book was fantastic. I also had two other thoughts and I know it would be a long stretch but have you thought about making this into a movie series? I just picture seeing the trailer to age of myth while listening to The Sound of Silence by Disturbed. This would be such an awesome movie series. I know that's a stretch but just wanted to know your thoughts. The other thought I had was about you attending comic con for promoting your books. I have been to comic con in Providence, RI and in Boston and they have tables that would be perfect for you. I'd absolutely love to meet you and ask more questions about the series but this is just a thought. It would likely be a great experience and I'm sure it would be a good promotion if your series. I know this post is long but I appreciate you reading through to this point, it means a lot when an author truly makes the effort with their readers. Im done listening Age of sword. Audible realesed the book yesterday. I can only say the 2 books of age of legends is excelent your best work so far. I have all your books. Im a big fantasy fan with Robert Jordan, Brandon Sanderson and Robin Hobb as my favorit writers and now i can add on more to that list. So thank you for a great listning experince. So, I love all your books, but as I start listening to age of swords, I have a vague recollection of listening to a story prior to age of myth about glendora before there was one ruler. Did you do a short story somewhere or did I just dream that up. That one might have been a dream, Tom. When will the Age of Swords paperback version will be release? I beg you to let me be a beta reader for age of war. I cannot and will not wait until February (probably longer). Pleaseeee??? This is a serious request. I've read both Riyiria books on Audible several times, I love them so much. I'm coming to the end of Age of Swords (after re-reading Age of Myth), and I dread finishing it. Tim Gerard Reynolds is the perfect narrator for your books! I see and appreciate how much you've grown as a writer and look forward to reading and savoring each "Age" book plus any other treats you publish. Because I don't read paper books any more, I miss out on things in paper books, like maps and the spelling of character names. Maps especially, because I enjoy seeing the relationships of places to each other. Thank you so much for this gift of worlds and peoples engaged in such fascinating journeys! Check out the "Extra" tab on this website and you will find three new maps that are actually better than what appears in the printed books. Love these book's... both chronicles and revelations. I would love to continue reading about what happened to Royce and Hadrian in the new empire. Do they see each other again ? What happens to Mercy ? The ending was great, but I was sad to leave the characters. Especially Hadrian and Arista. Any word on when we can preorder our signed hardback copies of Age of War? I have already pre-ordered the Audible and Kindle and just need to acquire the hardback. Your books are so exciting. Will we ever get to see what happens after the events in the last book? Like will we see a series or little short books after Hadrian and Arista's kids (if they have any) and how Royce raises Mercy and how Modina raises Allie. I just wanna see how my favorite characters are doing in the future. I suppose is there are plans for a future series, you wouldnt spoil the surprise, but should I be looking forwards to a sequel??? Hello! I just finished Theft of Swords last night and I have a question regarding something that confused me. I thought that the one to wield the sword that killed the Gilarabrywn was the Heir of Novron as well as emperor, but Esrahaddon makes a comment at the end of the book that he is still searching for the Heir. Are the heir and emperor two different people? Is the emperor(ess) supposed to be the Heir's protector? I was a bit confused. Clarification would be most welcome...thanks! Started the next book! It is not a good practice to believe the Church of Nyphron. They lied to you. Why did you have Merrick Marius make a a copy but never tell us why or how it was used? I adore this series!!!! Thank you for writing such a fun read! It is super misleading to tell people they can read Age of Myth without having read Riyria Revelations. That is what hapened to me. I liked Age of myth very much, so moved on to Revelations only to discover that the big secret of the series has been completely spoilered by having read Age of Myths. You spend six books getting to the bottom of this secret, which is completely obvious from just reading the cast of characters of Age of Myths. I still loved Revelations but am really sorry to have not have had a fresh viewpoint of it. I wish you mention this somewhere so other people's experience is not ruined. Best. Books. Ever! I've listened to them several times (awesome narrator by the way) both chronologically and published. Both ways are great! I'm currently listening to them again, (chronologically) for the 5th time and I'm exited for the Legends series to finish so I can add them to my library. Thank you for providing a fun, interesting world that does not require strong language or undue violence to make the story great. I love and care about the characters and it feels like old friends are visiting when I listen to the series again. Keep writing and I'll keep reading/listening! Aloha! I listened to Revelations and Chronicles in chronological order (Io loved that sequence). I loved the stories and I hope that your wife can pressure you :) to write more about Royce and Hadrian as I love those two! The series would be wonderful and fun made into a movie(s) or a series. Working on the beginning of Age of Swords and I'm loving the Dwarves. I've enjoyed the racial tensions and the cultures behind them you've instilled. It's refreshing to get into someone else's fantasy world that isn't filtered through the standard Dungeons and Dragons array I'm very used too. Can't wait to see what other cultures pop up outside of the main three races. I have fingers crossed for some more info on the Ghazel and the darker things of the world. Thank you for reinvigorating my imagination and helping me step out of the bonds I forged for myself by filtering my fantasy too much. I just got done listening to Winters Daughter and once again am blown away. I'm about to start Revelations (for the 7th time) but have a few questions that I can't find the answers to. I'm guessing that the terrible thing Miranda's mom did was abandon Royce as a baby. Was he a twin? Did Degan grow up thinking he was adopted even though he was actually her biological son? How did this story unfold? We can't all have the incredibly nuanced mind of Royce. Some of us are more like Haydrian. We take things at face value and miss some of the more subtler clues. Even without these questions answered the story is amazing as is. THANK YOU for sharing Royce and Hadrian with us. I love listening to them chatter and bicker with each other and find myself laughing and giggling at their exchanges. Thank you as well, for writing the stories that fill in the gaps between Chronicles and Revelations and I too would really love it if you would write a sequel series to Revelations. I'm not done with Royce and Hadrian and hope that you aren't either! I rarely read any book more than once. I usually devour it and move on. There have been a few exceptions but they are extremely rare. I have now listened to every single Chronicles, Revelations, and Legends available TWICE! And am STARVING for more! Additionally, I am going to collect the hardback versions to create a special library for my grandchildren. These are wonderful adventures. PLEASE KEEP WRITING THEM!!! I have been very curious about the colorful metaphor used in the Heir of Novron and in the Age of Myth. Would you please define the word and the phrase Novron used during his fight. It is not a term you have used in the glossary. I listen at work so I am also not sure of the correct spelling. Thank you for writing such an awesome series. I miss Hadrian and Royce. I have a question that has been bothering me for days. I just finished Chronicles for the first time and I loved it, but the whole Heir thing being Royce both made sense and also made no sense. What about the family that Dan was guarding that got killed? Was Royce the twin that was saved? If so, was he thrown out when the midwife found out he was mir and she just kept the necklace and gave it to Degan? Was Degan the twin that was saved, and Dan was somehow guarding the wrong family? If that was true, how did the midwife get the necklace? I am so confused. Was this ever addressed and I just missed it? Someone please clear this up for me. What about the family that Dan was guarding that got killed? - Dan was guarding the right family. Was Royce the twin that was saved? - Yes. If so, was he thrown out when the midwife found out he was mir and she just kept the necklace and gave it to Degan? - She tossed Royce out when Arcadius started poking around looking for baby Royce, whom he knew was the surviving heir. She kept the necklace because she thought it was valuable. Was Degan the twin that was saved, and Dan was somehow guarding the wrong family? - Nope, Dan was guarding the right family. If that was true, how did the midwife get the necklace? - She took it off of the dead twin baby (the heir put it on what he assumed was his only, and now dead, child) after she managed to deliver Royce out of his dead mother. She then ran out with both baby Royce and the necklace. Is Lady Dulgath Macareta(sp)? The spin on the left heel makes me wonder...I can't remember if Lady Dulgath ever said her real name. Oh my starz!!! I was thinking the same thing! !...had planned on going back into the legends books to see if she 'spun? ?..on her heel! Am actually hoping it's Makareta... wonder if we will find out?? Have you considered a Spoilers forum? There are some more detailed questions that I would like to ask that haven't been answered in the books yet. It's fun to speculate the answers then see if your correct when the books come out. Hiya Mr Max. I couldn't message you above so I'm doing it here. I missed the same things regarding...forgot already...had to scroll up to look...about HOw Royce became the heir...and to be honest...i dont' even remember Nevrik! I am re-reading this series...just finished Dulgath...didn't even know about Winter's Daughter... so i plan on re-reading Chronicles again... perhaps more closely..yes??!! I am super exited to see two of my favorite book series continuing (in contrast to some king killing and throne gaming stories). And now, you have announced a new series that fills the time gap between Empire and Riyria. Here are two kind of contradicting questions/remarks: (1) I don't see another Riyria Chronicles book in the making? I so enjoyed the humor, the witty dialogue, and the insides into the back stories of Royce and Hadrian. Please, don't let their voices be silent for too long. (2) Sometimes, it is better to not tell everything in all detail. As asked and replied to in an earlier comment, I too would like to know if Royce and Hadrian ever meet again after the end of Revelation - but I agree that this stories' end better stays untouched. Aren't you afraid, however, that with the bridge series you are exactly doing that. To borrow from another of my favorite stories: Don't you're running the risk of the story becoming "thin, sort of stretched, like butter scraped over too much bread.”? 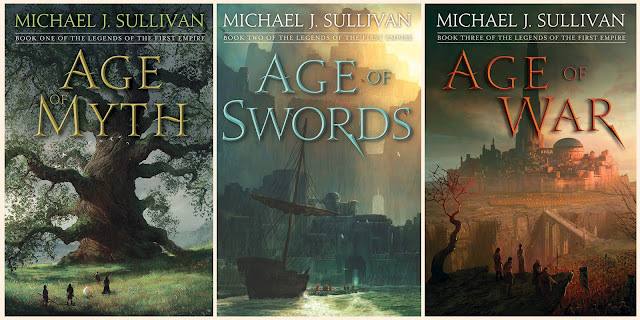 I am an audible fantasy book junkie and Mr. Sullivan’s works are some of the few books I actually go back and re-listen to. His characters are interesting, the drama is well executed, events always unfold in a way slightly different than what I expect, and throughout it all he manages to keep a sense of humor. But if I had to name the one thing above all else that keeps me coming back, it would be that he writes (and Mr. Reynolds narrates) stories that are genuinely fun to listen to. They move and flow in an enjoyable fashion. I wish I could be more specific, but, for me, that’s what it comes down to. Mr. Sullivan, if you happen to read this, I just wanted to say thank you and keep up the good work. I am enjoying everything you are writing, and the fantasy genre could do with more authors like yourself. I just finished reading chapter 15 in Age of War... I gotta say, this is among, if not, THE best chapter(s)! The character development through interrupted scenes, the set up for story-timing, the revelation of backstory, then the general cluster-mess of a climax... fantastically done, sir! As much as I dug on Hadrian and Royce, this Age Of series is a really good follow up. How can I get my hands on the next three books as quickly as possible? opinions ( which by the way i love how the order i’ve chosen to read them in) Mr. Sullivan has given OVERLY extensive suggestions on the order of the books... from what other people think; to a re-cap of them; the timelines both chronological and publications.... let’s not forget he even let us know how many years apart they are. What exactly should he have mentioned ? If i had read them in a didferent order certain mysteries would have been revealed and others kept hidden... Spoilers is s really strong word, we are taking about books written... you know what forget it. You should have read them in chronological order !!! Like he suggested ..Mr Sullivan you can tell a the help of his wife thought a lot about everything. so i’m glad you are enjoying them but just relax. let yourself have that ah hah moment.. I am so obsessed w your works mr sullivan . i go too sleep in the world you have created and i love learning new secrets. you’re extremely talented . thank you. Yes!! Who do you think would play Hadrian and Royce? I would say James Bradley for Hadrian, and Jim Sturgess for Royce. Okay, I have a question about Royce and Hadrian. What would their star signs be? Also, I don't know how you could make a series SO GOOD!!! I absolutely love it and I have read them over and over again!!! Also, do you think these books could be turned into a movie or t.v. series? That would be AWESOME! (though, they would probably change a lot of things, and they would make the whole thing horribly incorrect). find Age Calculator then it is Overall looking for a Chronological age or anniversary calculator then this is your best option in age Calculator. Calculation of age with interesting details! Hello, I'm not sure where to take my inquiry, but I ordered a couple items from your online store three days ago and haven't received email confirmation yet. The money has already come out of my bank account, but my bank statement is the only trail of information about this purchase. When and how should I receive confirmation of my order so I can track it's progress? Hello, just wanted say thank you. I am a new reader to work and I really enjoyed entering a new world. I'm a big Terry Brooks, Jeff Wheeler, Brian Sanderson, Robin Hobbs fan and I now I add you to my list. I like the way you write the language that very contemporary and very relatable to our way of being today. Your characters are realistic and feel the world around them. Storytelling, connecting the characters from book to book is not an easy task. So I thank you. And totally love how you and your wife partner with your work. I look forward to reading the rest of series. Happy Holidays, Maria. I just discovered your books and I can't put them down.I absolutely love them. I can't get enough of Hadrian and Royce, their bantering,the humor, the love hate relationship and their fate to be partners. Thank you!!!! I have just completed I have just completed The Chronicles and then The Revelations series and I am so hooked, It was not until a little into The Revelations that I found my mind unpacking old chess strategy moves that I relalized how interwoven those moves were into the plot. I loved it all the more when my mind clicked on the complexity of this crafting. I also identified what I assumed to be the authors inserting himself as a character within the plot, at least I hope that it was the authors own persona or avatar. Bravo Bravo! "Heir of Novron" I'm in the middle of the book, I don't know how I'm going to make it through without... You know who, I'm sobbing, but I must carry on! 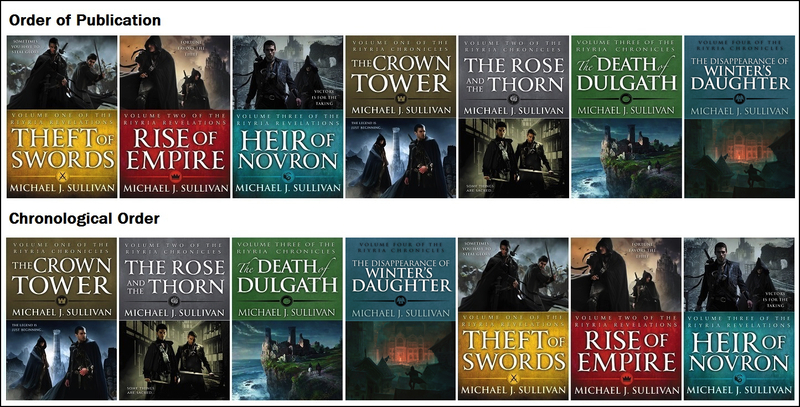 I discovered your novels this past summer and I am now a Michael j.Sullivan book dragon. I NEED them all in hardcover and soft cover and I shall try audible soon.i have never listened to an audio book before. Anyways I just finished the disappearance of Winters Daughter. Hadrian and Royce have definitely not overstayed their welcome. I would like more please. Also there are so many things still to see after the most recent storyline. I want to see Royce with his daughter I really want to know what happens next. Please write more! I could easily read this series again and I will to see what i may have missed in certain conversations etc. I don't feel daunted by your novels or the amount of them. Not like when i look at my shelf of Robert Jordan books.and as another commenter mentioned the who killed Asmodean? Haha! I am glad you dont do that to us.I am looking forward to you filling in any gaps for us. The world you have created is Amazing and I LOVE IT. Please continue..you are a very talented writer. Michael, you are amazing! I’m so glad you couldn’t stay away from writing! I own every one of your books on audible, and several on paperback. I also have pre ordered Age of Legend on audible, and participated in the Kickstarter to get several other books in hardcover, signed. I’m so excited to give those to my wife. She loves your work almost as much as I do! Above you said you have a few more Royce and Hadrian books planned in the Chronicles series, if there is demand for them. I can say, there definitely is! Do you have plans to release more?